Tamera is a holistic peace research and education center, and ecovillage where around 200 people work, research, study and live, building a model for a future without war. In August 2017, Tamera hosted activists, leaders of movements, Indigenous elders and youth from around 40 countries, all with experience of sacred activism, with the aim of reconciling Indigenous wisdom with futuristic thinking. They want to facilitate a growing global alliance in the spirit of “Defend the Sacred” and to this end, hosted the next international gathering in Tamera from August 1st – 10th 2018. 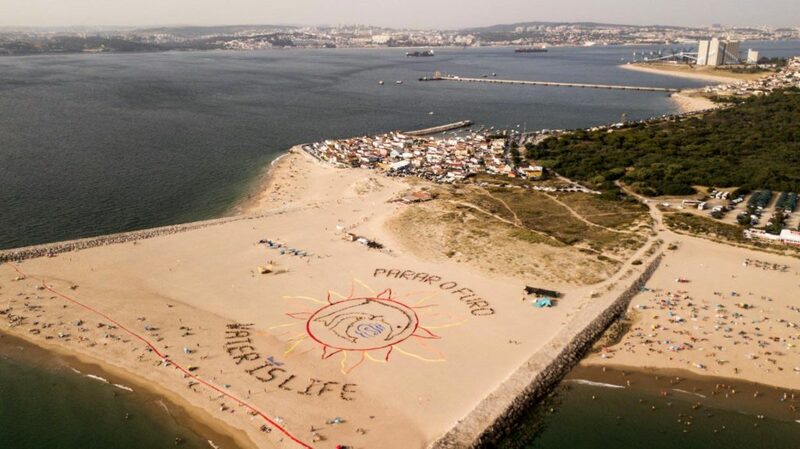 Aligned with this gathering, a large scale aerial art action was orchestrated at Cova do Vapor beach near Lisbon on August 4th, which is part of an international media campaign against fossil fuel exploration and for a just transition to a regenerative society. 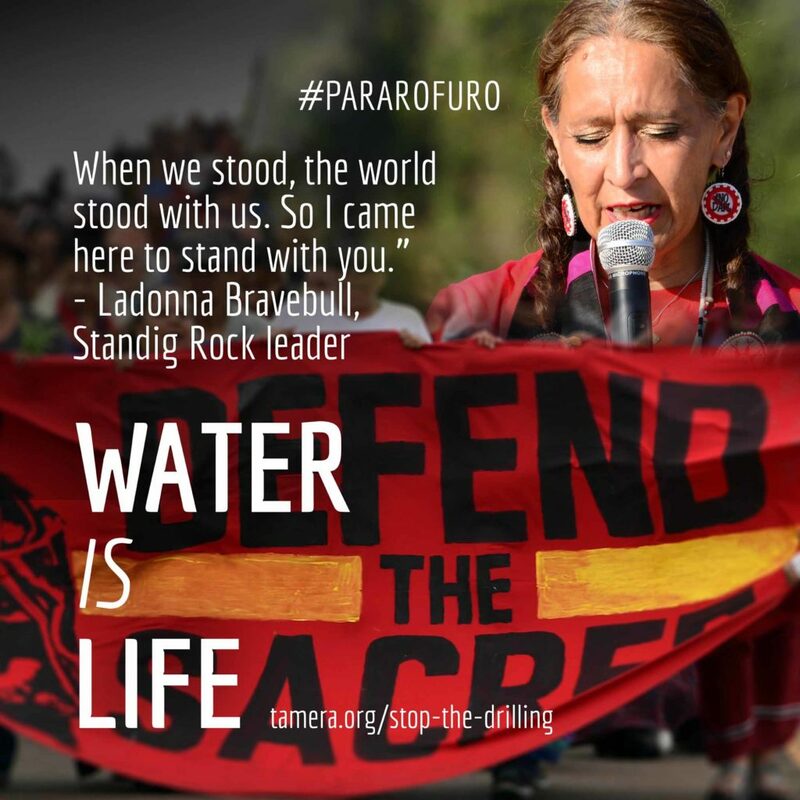 The message is: “Parar o Furo,” “Stop the Drilling” and they’re closely collaborating with a coalition of national groups (such as Academia Cidadã, ALA, Campanha Linha Vermelha (also a GF grantee! ), Climáximo, Plataforma Algarve Livre De Petróleo, Preservar Aljezur, Stop Petróleo Vila do Bispo, and Tavira em Transição). For more information, visit the campaign page. The goal is to definitively cancel the contracts for oil drilling and fracking in Portugal, especially to stop the oil drilling off the coast of Aljezur by oil companies Eni and Galp, scheduled to begin on September 15. There’s never been oil exploration in Portugal, and there no reason not to keep it that way! To stop the drilling, Tamera and crew want this action to draw the attention of national and international media outlets as well as to mobilize the support of organizations and celebrities worldwide and to engage young people and marginalized communities in the greater Lisbon area. Our grant went towards the aerial action on the beach, a big bang of collective artivism used to catalyse conversation and spark media attention to the extractivist threat. On the hottest day in Portugal since weather records began, the team traveled by bus to the beach of Cova do Vapor near Lisbon, where the Tagus river meets the Atlantic Ocean. Tamera’s Solar Test Field team set up a demonstration field with 12 solar cookers and gifted solar-cooked food to beachgoers to show that clean, regenerative alternatives are possible and that the action is not simply against something, but clearly in favour of something else. Together with several hundred participants, artists, activists, and friends from all over Portugal, guided by the aerial art activist John Quigley, accompanied by prayers from eight traditional directions, Defend the Sacred activists formed a huge message in the sand with their bodies: a mother and child dolphin, surrounded by a bright sun and the words, “Stop the oil drilling” and “Water is life”. Drones filmed it from the air and Portugal’s main TV channel SIC broadcasted it in their evening news. 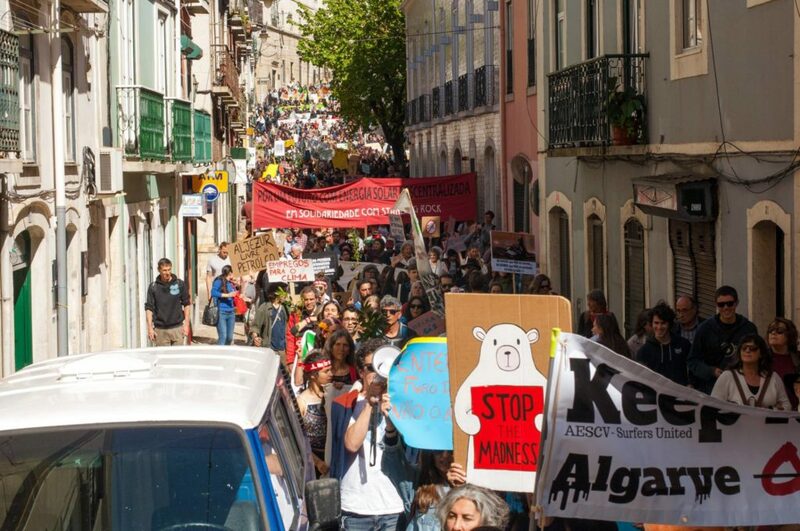 On September 8 “Marcha Mundial do Clima” will start in Lisbon, Porto and Faro at 5pm. It was a powerful day. But can such an action actually influence political decisions? Nobody knows all the correlations between cause and effect. As a matter of fact, seven days later, Portuguese President Marcelo Rebelo de Sousa said that he needed to reconsider his position on this issue, after meeting with activists. 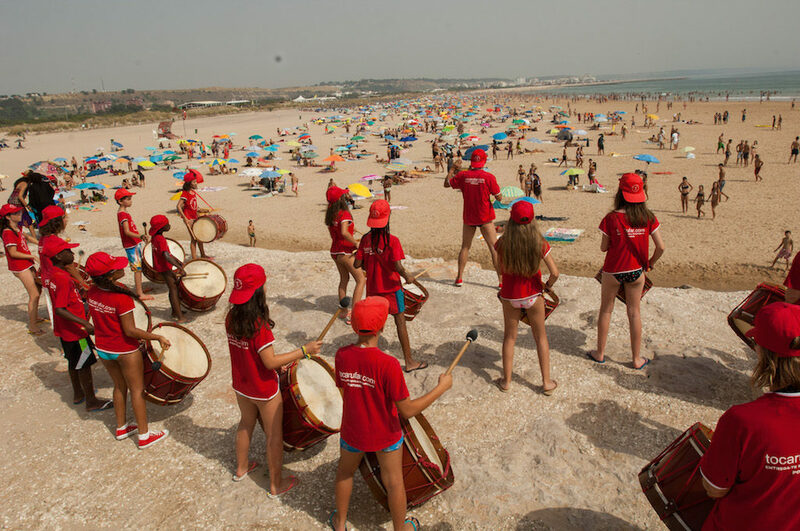 And nine days later, a court temporarily suspended the planned oil drilling off Aljezur (Algarve). Of particular significance is the solidarity shown by indigenous groups from around the world, coming to stand together against a system of environmental oppression, of short-sightedness and of corporate interests. And Tamera’s role in catalysing the meeting as well as this action is monumental. Ecovillages whether formal or informal, are few of the real-life prototypes of alternatives, of demonstrable communities trying to operate with new values, new systems, new ways than the by and large neoliberal system that the majority of the world’s populations find themselves in. However, many ecovillages remain apolitical or at least quite quiet. Tamera is truly taking the lead in highlighting the importance of activism and spreading the message of the core tenets that they uphold within their community and they are taking this message of regeneration and healing the world, in clear, tangible ways far and wide and need as many allies, funders, supporters as they can get. We are proud to stand alongside them on this journey.